Recipient of the Editor’s Choice Award by Children’s Technology Review, this interactive car game for children ages 2 and up introduces your little builder to 8 different construction vehicles, each with its own mission to complete. This app is full of animations, videos, and sound effects, and your child will get a kick out of making the vehicles move by touching or tipping the screen. $2.99, 4+ rating. 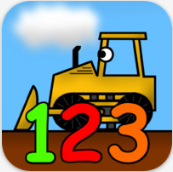 Perfect for toddlers and preschoolers who love all things construction, this app works on number identification and counting in a fun and easy way. Fun animations and sounds keep kids engaged, encouragement and positive reinforcement help motivate, and simple controls and verbal statements make this app easy for young children to enjoy independently. $0.99, 4+ rating. 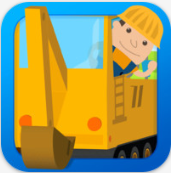 With this app, your child will learn about colors, numbers, and shapes while in the front seat of popular construction trucks. 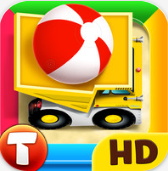 Geared towards kids aged 2-5, this app features 3 different trucks, 3 different games, free play mode, interactive environments, animated characters, and sounds throughout. $1.99, 4+ rating. 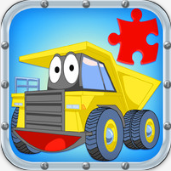 Learn how trucks work and what they do with this app, which combines high quality cartoon animations with jigsaw puzzles. Features include 12 puzzles, 3 difficulty levels, optional timer, and fun and funny animated cartoon trucks. $1.99, 4+ rating. 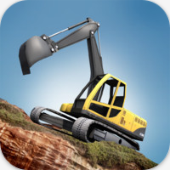 An app for parents and children to share, Machine World allows you to operate virtual machines that behave like the real thing, from cranes to excavators. The controls have 2 modes: An easy mode suitable for children or casual play and also a realistic mode more in keeping with actual control standards. Try for yourself and discover why this app is rated in the top 10 in 32 countries. $2.99, 4+ rating.